Indy has now made 2 custom made suits for me, both of which are outstanding! The first was a 14 oz. wool, midnight blue three-piece, with the vest having a lapel collar. The second was a 12 oz. wool/cashmere, three piece. Both of these have drawn compliments from co-workers and others - the material and styling are just first rate, and people notice. 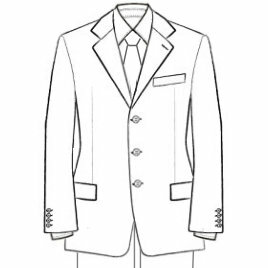 I look forward to several more purchases from Magnoli Clothiers - the best I've seen, not only in craftmanship, but also in customer relations geared toward adapting a suit to the customer's desires. Great job, Indy! Keep it up.